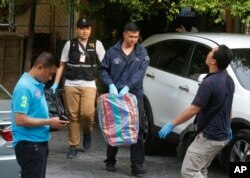 This image released by the Royal Thai Police shows a man who was arrested at an apartment on Aug. 29, 2015, in Bangkok, Thailand, along with evidence police said included bomb-making equipment. 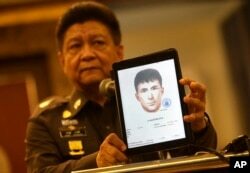 Police spokesman Lt. Gen. Prawuth Thavornsiri shows a photo of one of three men Thai authorities have issued new arrest warrants for in connection with the bombing case, in Bangkok, Thailand, Sept. 1, 2015. Thai policemen take evidence at an apartment on the outskirts of Bangkok on Saturday, Aug. 29, 2015.